Lets have a meeting to go over your needs. We want to find your dream home. Knowing more about what you are looking for will help us find that home for you. We will narrow down the builders by the area's of town or neighborhoods you are interested in. We understand you are not just buying a home, you are buying into the community too. If you are looking for specific neighborhood features like Pool, walking trails, or lots of tree's, Pink can help. 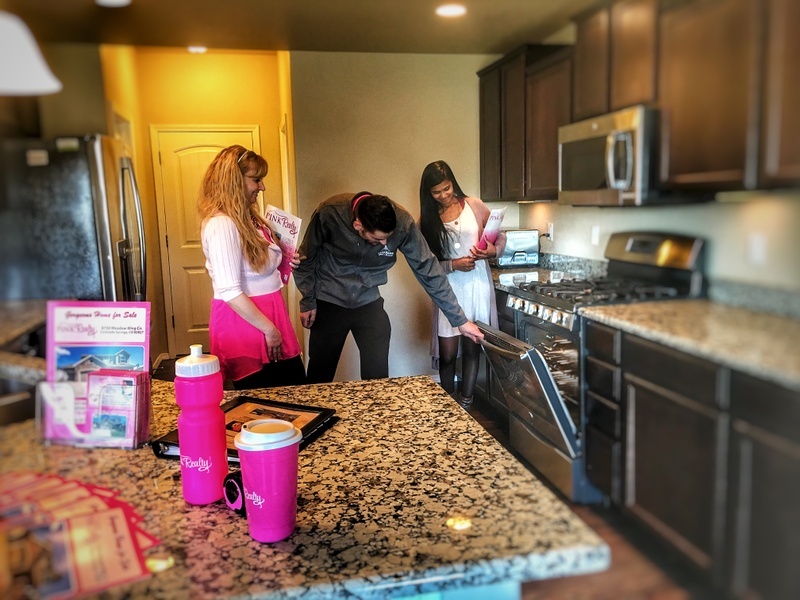 Pink Realty will begin touring homes with you. Be aware that sometimes the builder will only have a model home to see in a neighborhood. We may have to visit another community to see a floorplan that meets your needs. If the builder does not have a particular floorplan available we may be able to tour a home that they sold in the past with the current owners approval. Now that we have toured homes and you picked the home that you love we will contract with the builder to build your new home. The builder will usually have a number of lots available to choose from. Some lots may have a premium depending on views the lot offers and size. The homebuilder will have their standard features listed that is included with the Base Price. However if you want additional items you pay extra for that. When you pick options it increases your purchase price. Most options that builders don't include are finished basements, A/C, and garage door openers. Now that we have all your options picked out the builder will write the final purchase contract. The contract will list all your options that you chose, the lot you chose. Please note the builder contracts are pro-builder. If you are concerned about the contract we recommend consulting a real estate attorney. The home construction will usually take around 6 months. During the construction process you will not be able to enter the home without prior approval from the builder. There will be scheduled walk-throughs numerous times during the build process. Before we start the framing of your home your Personal Builder meets with you to review final plans, layout, and your selections. We will be scheduling an appointment at the design center. This is where you pick your color's for your new home. Be careful, as the builder may try to get you to put additional upgrades in your new home that was not included in the standard package. Doing this will increase your purchase price and you will need to get approval from the lender. During the design center appointment you will pick colors for the exterior of the house, kitchen cabinet colors, flooring, tile, etc. This is actually a pretty fun process. After the framing is finished, and the mechanical and electrical systems are being installed we invite you to come walk your home with us before we drywall and move to the finishes stage of construction. The first walk-through usually happens when the framing is up on the house. We will walk-through with the builder to pick out locations that you need electrical outlets. Perhaps you need internet outlets on certain walls. Or perhaps you plan to hang a TV on the wall in certain area's. This is the time to let the builder know so they can mark the locations down. Construction is almost complete. This is your opportunity to walk the home and ensure everything is to your satisfaction. We also orient you to the operation, care, and maintenance of your home. Usually scheduled for the same day as your closing, this final walkthrough is to showcase your new home, make sure you know how everything works, and review any items from your walkthrough to ensure they have been completed to your satisfaction. Your Homeowner Orientation occurs once your home has been completed. It is an introduction to your new home and its many features. This orientation meeting goes beyond the traditional walk-through to include a detailed demonstration of the quality features in your new home. We also review general information about your home and explain our customer service procedures. The closing, or settlement date, takes place at least two (2) full business days after your homeowner orientation and is held at the title company. We will arrange your closing appointment and will confirm the time and location and will inform you of the necessary items you must bring with you to the appointment. The title company will review the details of your home purchase, explain all the documentation you are required to sign, and will finalize your purchase. Once finalized, you will receive your keys and may move into your brand new home! Our dedication to providing exceptional customer service doesn’t end once you receive your keys. Our goal is to maintain your quality home standards are being met even after you have settled into your new home. Our warranty specialists will contact you to schedule any repairs or address questions you may have about your new home. Eleven months after closing, we revisit our commitment to your satisfaction by contacting you to take care of any warranty work and discuss questions you may still have about your new home. It is our way of backing up our promise to build a quality home that you and your loved ones will be happy living in. Looking to Buy a New Build Home?